At Cambridge Engineering we know that safety is not only important it’s required. Our commitment to safety and innovation are the guiding principles for everything that we manufacture and it is because of this commitment that we strive to manufacture the safest HTHV direct-fired energy saving heaters available. Our HTHV heaters are inherently safer because our products use 100% outside air to heat the space. What does 100% outside air provide? 100% outside air provides VENTILATION & proper ventilation means superior Indoor Air Quality. At Cambridge we have a saying, ”Buildings Don’t Need to Breathe But People Do”™. Save up to 70% on combined gas and electric energy costs by installing Cambridge HTHV energy efficient heaters. 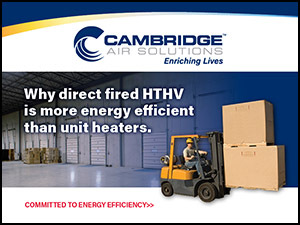 Cambridge HTHV direct gas-fired space heaters with Blow-Thru® technology are used to heat and ventilate commercial and industrial buildings where non-ducted heating solutions are specified. 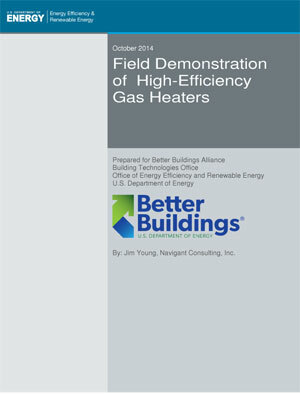 Our HTHV technology is recognized as the best and most energy efficient way to heat and ventilate commercial and industrial buildings in both new and retrofit installations. By definition HTHV technologies are certified to a discharge temperature which is greater than or equal to 150°F and a temperature rise greater than or equal to 140°F and has the ability to both heat and ventilate commercial and industrial structures. These energy saving heaters provide more than just heating. They also have the ability to provide Heating, Ventilation, and Destratification all from the same piece of equipment. 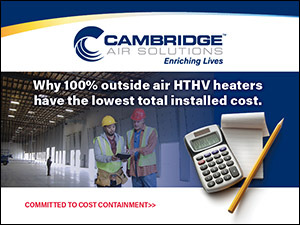 HTHV products are the Safest, most Energy Efficient way to heat and Cambridge’s HTHV products also have the Lowest Total Cost of Ownership when compared to other heating technologies, especially when compared to standard efficiency unit heaters. Our HTHV products have been proven through both the DOE study and our own building studies to save between 20% to 70% on energy depending on the building, location, application, and installation. This shows that HTHV heaters are the most energy efficient space heater on the market. Whether it is a mechanical contractor looking for the lowest first cost or a building owner looking for the lowest total cost Cambridge Engineering’s HTHV products will meet your needs. The HTHV technology in our energy efficient heaters offers the lowest overall first cost because one piece of equipment will heat, ventilate, and destratify. 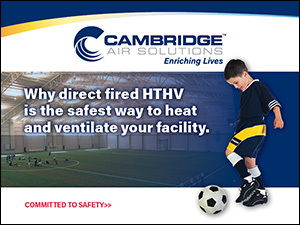 With other heating technologies you have to include ventilation and destratifation equipment to accomplish the same indoor air quality goals as on Cambridge HTHV direct fired heater. And because HTHV is very energy efficient your long term operating cost and facility impact cost are drastically reduced as well.